At The Whalen Company, we have the replacement parts and the knowledge to support your comfort conditioning system, no matter the age of your system. 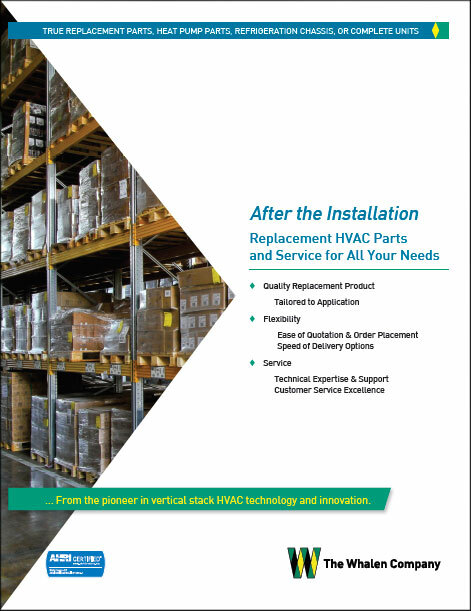 You can rely on us to deliver a solution to meet your replacement unit needs. With our technical expertise, we focus on providing customers with true replacement parts or replacement units for products manufactured by The Whalen Company dating back to the early 1970’s. By offering true replacement parts, heat pump parts, refrigeration chassis, or complete units, The Whalen Company can save you time and money by supplying exact replacement units that don’t require field modifications. This gives you the fit and function of your vintage unit built with the enhanced technology of current systems. The Whalen Company has the aftermarket parts and supplies to handle your replacement needs. Click the link below to send your product information to your local Whalen representative and they will contact you with the information you need. We look forward to helping you find the solution for your job.